Ok thanks. Did Johnsons have an Australian factory? The saucers I usually see these cups on are a matt brown home ceramics looking (but not) - fully covered in the same glaze with no marks. From memory yes johnsons had an australian factory. I am sure one of the english people told me it was an option if things didnt work out at crown lynn. Geoff Ford's Encyclopaedia of Australian Potter's Marks (2nd Edition) says an Australian subsidiary of Johnson Brothers was established in Leichhardt, Sydney in 1947. 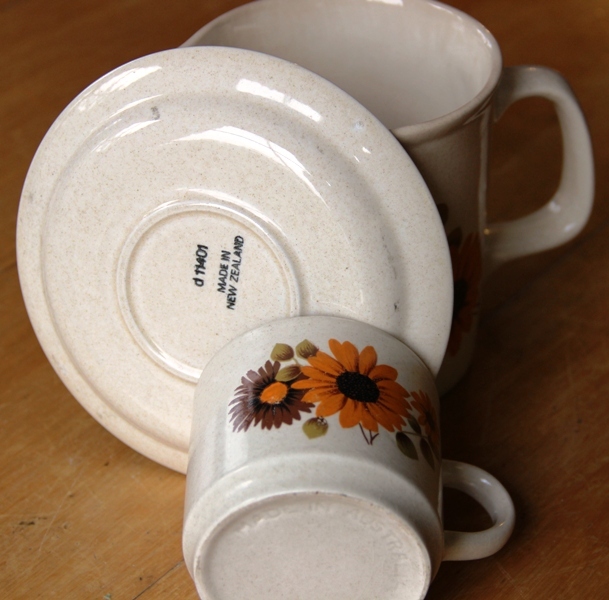 They used the name Delamere Art Pottery and from 1958 concentrated on earthenware domestic ware. He recods a backstamp used from 1958 to the late 60s saying "Sovereign Pottery Johnson Made In Australia" and another used from the mid 60s to the early 80s "Johnson Of Australia". Thanks very much. I picked up couple of plates today so the cups, saucers and jug wouldn't be lonely. They had a cursive "Johnson's of Australia" backstamp.